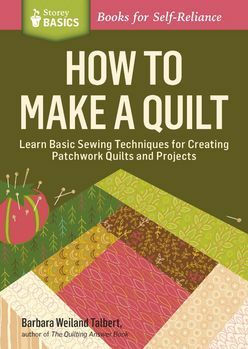 How to Make a Quilt: Learn Basic Sewing Techniques for Creating Patchwork Quilts and Projects. With basic sewing skills and these simple step-by-step instructions, you can easily learn to make your first quilt! Barbara Weiland Talbert outlines the complete process in an easy-to-follow sequence, from selecting a design and choosing fabric to cutting pieces, assembling blocks, assembling the quilt top, and finishing your quilt. Learn Basic Sewing Techniques for Creating Patchwork Quilts and Projects.